Is Having More Than One Display Useful? NVIDIA 3D Surround Vision using 3 LCDs. Pretty much every laptop and desktop computer sold on the market today has the ability to run more than one display. In the case of a desktop, this would be multiple external displays while laptops can do this with its internal display plus an external display. In the case of a very small laptop, the reason for having an external monitor is quite easy to understand as it offers a larger image with generally a higher resolution so that it is easier to work with. It can also be used as a secondary display for presentations such that the presenter can see their screen while the audience can view a larger display. But beyond these obvious reasons, why would someone with a desktop necessarily want to run more than a single monitor? The main reason for running multiple monitors is economic. While higher resolution displays have come down significantly in price, it is still extremely expensive to get very high-resolution displays. For instance, many 4K PC Displays cost around $500 or more for essentially a 3200 by 1800 resolution. That is fours times the resolution of a single 1600x900 resolution display. Now if you wanted that same workspace, you could purchase four smaller displays each with the common 1920x1080 resolution and tile them together to get a higher resolution display but pay the same or less. There are really only two things required to run multiple monitors on today's modern PCs. The first is a graphics card that has more than one video connector. A typical desktop motherboard will feature two or three video connectors while a dedicated graphics card may have upwards of four. Some specialized graphics cards have been known to have up to six video connectors on a single card. There really are no software requirements in order to do this as Windows, Mac OS X, and Linux all have the ability to run them. The restriction usually comes down to the graphics hardware. Most integrated graphics solutions are limited to two displays while many of the dedicated cards can go up to three without too much of an issue. Be sure to read any documentation for the graphics card, though, as it may require that the monitors run on specific video connectors such as DisplayPort, HDMI or DVI. As a result, you must also have displays with the required connectors. Cloning, on the other hand, means that a second screen is used to duplicate what is seen on the first screen. The most common usage of cloning is for individuals who are giving presentations through applications such as PowerPoint. This lets the presenter focus on the primary smaller screen while the audience can watch what is happening on the second screen. While the economic cost of multiple screens is definitely a bonus over a single larger screen, there are drawbacks to using multiple monitors. Desk space is a concern again as LCD monitors have increased in their size. After all, three 24-inch displays can take over an entire desk compared to a single 30-inch LCD. In addition to this problem, tiling displays can require specialized mounts to properly hold displays so they will not wobble or fall over. This decreases the economic benefits compared to using a higher resolution display. Since the two screens are separated by the bezels that surround each screen, users can often be distracted by the empty space that resides between the displays. This makes programs that span both screens to be quite distracting. This is not the problem with a single large screen but is something to deal with on multiple monitors. The problem is not as great as it once was thanks to decreasing bezel sizes, but it still creates a gap in the combined image. Because of this, most people have a primary and secondary screen. The primary sits directly in front with the secondary either to the left or right and runs less used applications. Finally, there are some applications that will fail to properly use a secondary screen. The most common of these are software DVD applications. They tend to display the DVD video in something called an overlay. This overlay function will only function on the primary screen. If the DVD window is moved over to the secondary monitor, the window will be blank. 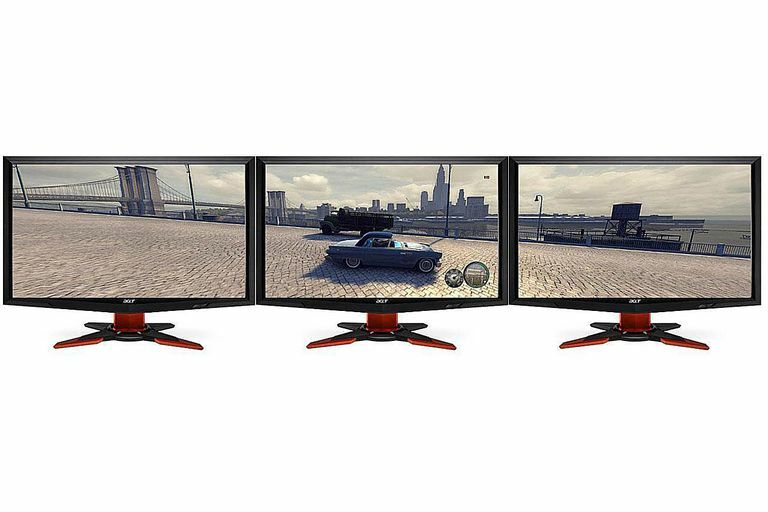 Many PC games also will only run on a single display, failing to use any additional monitors. So, should you use multiple monitors? The answer really depends on how you use the computer. Those doing a large amount of multitasking that requires the windows to be visible at all times or do graphics and require a preview window while they are working will. Gamers that want a more immersive environment will also benefit, although the extra displays have some serious hardware requirements to produce a fluid image at the higher resolutions. The average consumer most likely needs to have as much on their screen at a given time and can handle a standard 1080p resolution screen just fine. In addition, there are many more affordable higher resolution displays that are coming to market that make having two displays not as much of an economic benefit.